Home EventsSeminar is canceled! “Coffee with Expert” about support for social business. Seminar is canceled! “Coffee with Expert” about support for social business. 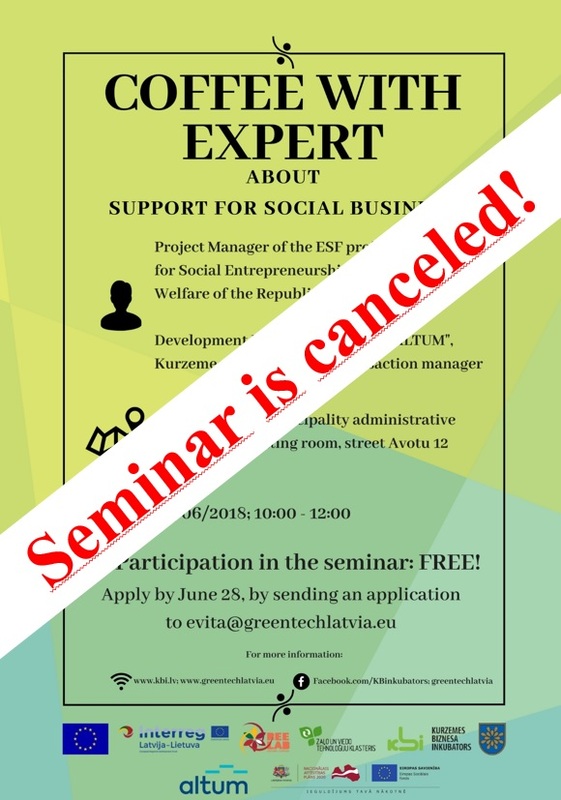 We would like to inform and taking into account the insufficient number of participants, that the seminar, planned for June 29, 2018, on “Support for social entrepreneurship” is canceled! Kurzeme Business Incubator in cooperation with association Green and Smart Technology Cluster, invites to apply for the June 29th seminar “Coffee with Expert” in Saldus. The theme of this time will be about the support for social entrepreneurship. To improve our and other quality of life, the place where we live, we have something to start with. One of the options to do this all is to start a social business. The aim of social entrepreneurship is to promote the improvement of the quality of life of society and to promote the employment of groups of people at risk of social exclusion, creating a favorable business environment for social enterprises. Therefore this is a very good way to make our surrounding community and environment more friendly, more successful and prone to development and a better future for all of us. About the most current information about support for social entrepreneurship, about what you need to know to deal with it, who can apply, what is needed to get it started and many other important aspects will be told by the project manager of the ESF project “Support for social entrepreneurship” of the Ministry of Welfare of the Republic of Latvia and Development Finance Institution “ALTUM”, Kurzeme region customer transaction manager. Everyone interested in the future, connected with the business, is invited to participate in the “Coffee with Expert” event. The purpose of the event is to encourage future and existing entrepreneurs to take steps in their intended direction. “Coffee with Expert” will be held on June 29th, at 10 AM, in the Saldus district council, in the new meeting room, Avotu 12. Participation in the seminar: free! 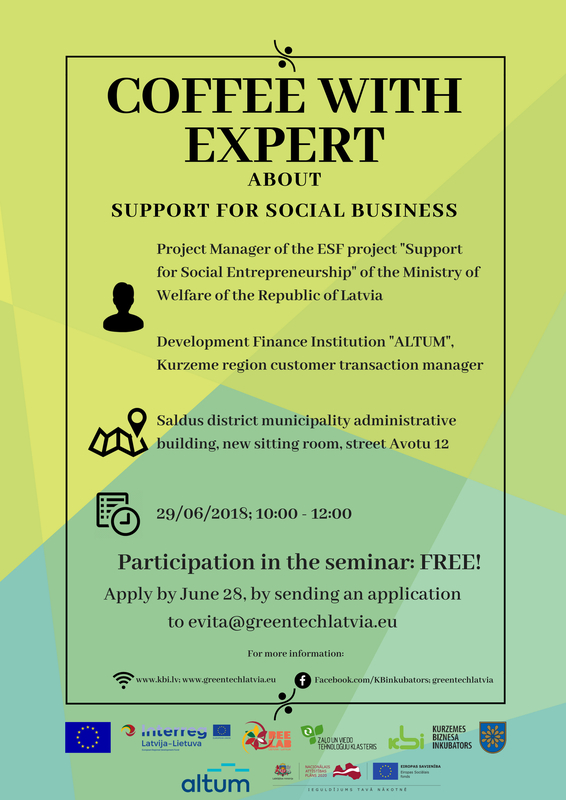 Registration for participation in the event until June 28th, by sending an request to e-mail: evita@greentechlatvia.eu. The number of participants is limited! “Coffee with Expert” is part of the BEE Lab project (Boost regional Entrepreneurship by Enabling cross border cooperation). 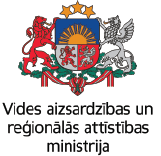 The project is co-financed by Interreg V-A Latvia-Lithuania Programme 2014-2020.